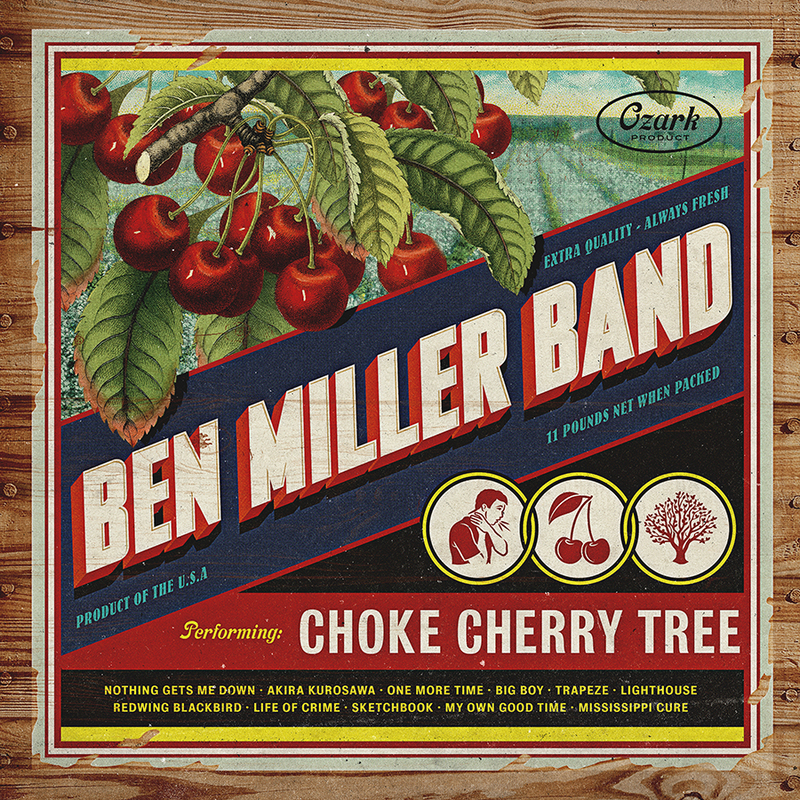 The Ben Miller Band is set to return with Choke Cherry Tree via New West Records this Friday, January 26th, 2018. The Joplin, Missouri-bred combo’s third album and second New West Records release introduces a retooled lineup with Miller and fellow founding member Scott Leeper joined by new additions Rachel Ammons and Smilin’ Bob Lewis. The pair’s multi-instrumental skills bring added authority to Miller’s rootsy new compositions while maintaining the high energy level that originally endeared the band to its fans. The 11-song Choke Cherry Tree was produced by Chris Funk of The Decemberists whose own multi-instrumental abilities helped expand the band’s sonic options. The album features guest appearances from Jenny Conlee and Nate Query (also of the Decemberists), Dan Hunt of Neko Case’s band, Ural Thomas, Rev Shines of Lifesavas, and more. Choke Cherry Tree also features an appearance by the renowned saxophonist Ralph Carney (Tin Huey, Tom Waits) who passed away on December 16th, 2017. The consistently compelling album offers new examples of Miller’s deceptively unpretentious songcraft, beneath whose ramshackle exterior lurks sturdy, infectious melodies and resonant, emotionally insightful lyrics. PopMatters is hosting a stream of the entire album, stating, “The Ben Miller Band became studio rats on their latest album and the attention to detail has produced the finest record of their career.” Hear the album in its entirety HERE. American Songwriter stated in their 4 out of 5 Star review, “Ben Miller takes a huge step forward and is now poised to push his organic, rickety yet sturdy roots music to the next level” while Innocent Words offered “Choke Cherry Tree is easily their best effort yet, an expansive mix of blues, folk, Americana and just enough swamp rock to make Leon Russell proud,” adding “It’ll be interesting to see if they can top themselves on the next outing -- a tough task given how solid Choke Cherry Tree is.” Rolling Stone Country previously premiered the video for album track “Akira Kurosawa,” commenting, “A stomping rocker that boasts a monstrous, wicked riff and compelling hook, ‘Akira Kurosawa’ is a stream-of-consciousness rumination on film and the nature of creating art.” Kurosawa, an incredibly influential Japanese filmmaker, is widely regarded as one of the most important filmmakers of all time and the video features clips from many of his films. See it HERE. Guitar World Magazine also recently premiered the video for the song “One More Time,” calling the band “a wild, roots-rocking combo.” See it HERE. Choke Cherry Tree is available digitally, as well as compact disc & vinyl via NEW WEST RECORDS. The Ben Miller Band are currently on their initial North American tour in support of Choke Cherry Tree and have also announced additional North American Tour dates supporting Buddy Guy (Please see all dates below, with more headline dates to be added). Since its formation in 2004, the Ben Miller Band has staked out an iconoclastic niche that’s established them as both a one-of-a-kind creative unit and a grass-roots fan favorite. Channeling a century’s worth of far-flung American musical influences into rousing songcraft that radiates with smarts and soul, Miller’s tunes achieve a musical and emotional depth that belies the materials (and the musicians’) rough exterior. Word of their charismatic live shows spread and the band has astounded audiences across North America, the U.K., and Europe, where they’ve toured to rave reviews (including a high-profile tour of Europe with ZZ Top, thanks to the patronage of avowed Ben Miller Band fan Billy Gibbons). Their early D.I.Y. approach extended to the lo-tech, largely self-built instruments the band members still play on stage, including Miller’s thrift-shop guitars and banjos and Scott Leeper’s one-string washtub bass. Glide Magazine – "Inside the Reckless Roots Precision of Ben Miller Band"
The Bluegrass Situation – "Gig Bag: Ben Miller Band"
Joplin Globe – "Successful harvest: Bonding process for new musicians helps Ben Miller Band produce new album"
Cleveland Scene – "In Advance of His Beachland Concert, Singer-Guitarist Ben Miller Talks About His Eclectic Approach"